From our small world we have gazed upon the cosmic ocean for thousands of years. Ancient astronomers observed points of light that appeared to move among the stars. They called these objects planets, meaning wanderers, and named them after Roman deities - Jupiter, king of the gods; Mars, the god of war; Mercury, messenger of the gods; Venus, the god of love and beauty, and Saturn, father of Jupiter and god of agriculture. The stargazers also observed comets with sparkling tails, and meteors or shooting stars apparently falling from the sky. NASA | IBEX | What are the Boundaries of our Solar System? 5. The Jupiter, Saturn, Uranus and Neptune were taken images by Voyager. 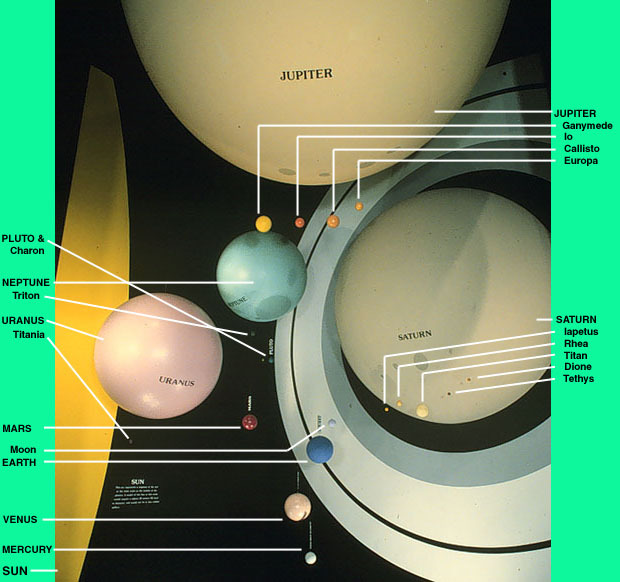 The International Astronomical Union (IAU) said that the definition for a planet is now officially known as "a celestial body that (a) is in orbit around the Sun, (b) has sufficient mass for its self-gravity to overcome rigid body forces so that it assumes a hydrostatic equilibrium (nearly round) shape and (c) has cleared the neighborhood around its orbit." At the same time, new moons are also being discovered, both around existing planets and within these mysterious new worlds. Once the existence of a moon is confirmed and its orbit determined, the moon is given a final name by the International Astronomical Union (IAU), the organization that assumed this task since 1919. Since the invention of the telescope, three more planets have been discovered in our solar system: Uranus (1781), Neptune (1846), and Pluto (1930). In addition, there are thousands of small bodies such as asteroids and comets. Most of the asteroids orbit in a region between the orbits of Mars and Jupiter, while the home of comets lies far beyond the orbit of Pluto, in the Oort Cloud. The Sun is the center of the solar system.The sun is the largest and most important object in our solar system. It contains 99.8 percent of the solar system's mass (quantity of matter). The sun provides most of the heat, light, and other energy that makes life possible. The sun's outer layers are hot and stormy. The hot gases and electrically charged particles in those layers continually stream into space and often burst out in solar eruptions. This flow of gases and particles forms the solar wind, which bathes everything in the solar system. Planets orbit the sun in oval-shaped paths called ellipses, according to a law of planetary motion discovered by German astronomer Johannes Kepler in the early 1600's. The sun is slightly off to the side of the center of each ellipse at a point called a focus. The focus is actually a point inside the sun -- but off its center -- called the barycenter of the solar system. The inner four planets consist chiefly of iron and rock. 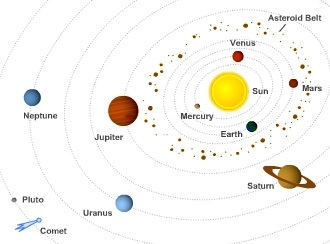 They are known as the terrestrial (earthlike) planets because they are somewhat similar in size and composition. The outer planets, except for Pluto, are giant worlds with thick, gaseous outer layers. Almost all their mass consists of hydrogen and helium, giving them compositions more like that of the sun than that of Earth. Beneath their outer layers, the giant planets have no solid surfaces. The pressure of their thick atmospheres turns their insides liquid, though they may have rocky cores. A distant object called Pluto has been referred to as the ninth planet since its discovery in the 1930's. But Pluto has so many unusual features that some astronomers think it may not be a planet at all. For example, it travels around the sun in an elongated oval path much different from the nearly circular orbits of the other planets. Unlike the other outer planets, Pluto is small and solid. But Pluto contains only 1/500 the mass of Earth. During the 1990's, astronomers discovered dozens of small rocky objects orbiting the sun beyond Neptune and Pluto. Astronomers had long suspected that the outer solar system had such a band of rocky material, called the Kuiper (KY pur) belt. The belt is named for the Dutch-born American astronomer Gerard P. Kuiper, who first predicted its existence. Pluto may merely be the largest of the objects in the Kuiper belt. 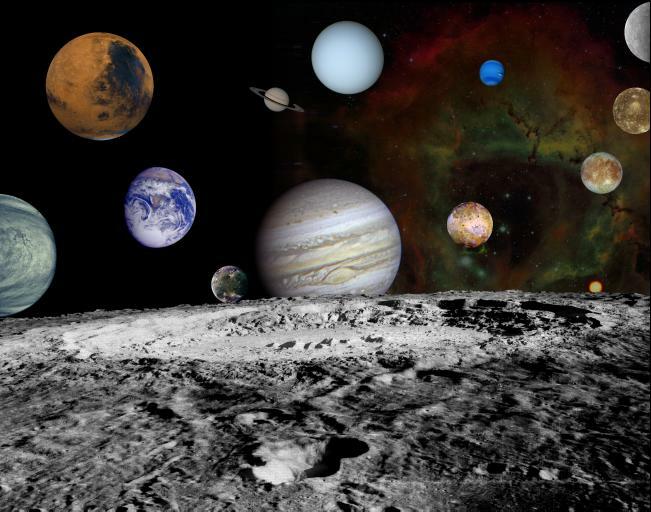 Moons orbit all the planets except Mercury and Venus. The inner planets have few moons. Earth has one, and Mars has two tiny satellites. 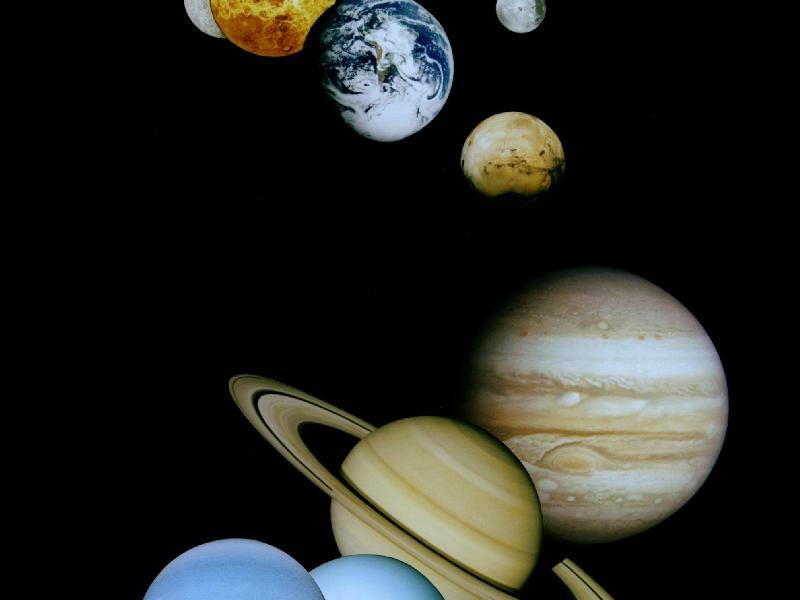 The giant outer planets, however, resemble small solar systems, with many moons orbiting each planet. Jupiter has 25 moons that are at least 6 miles (10 kilometers) in diameter, and many smaller satellites. Jupiter's four largest moons are known as the Galilean satellites because the Italian astronomer Galileo discovered them in 1610 with one of the first telescopes. The largest Galilean satellite -- and the largest satellite in the solar system -- is Ganymede, which is even bigger than Mercury and Pluto. Saturn has 25 moons that are at least 6 miles (10 kilometers) in diameter, and several smaller satellites. The largest of Saturn's moons, Titan, has an atmosphere thicker than Earth's and a diameter larger than that of Mercury or Pluto. Uranus has 21 moons, and Neptune has 11. 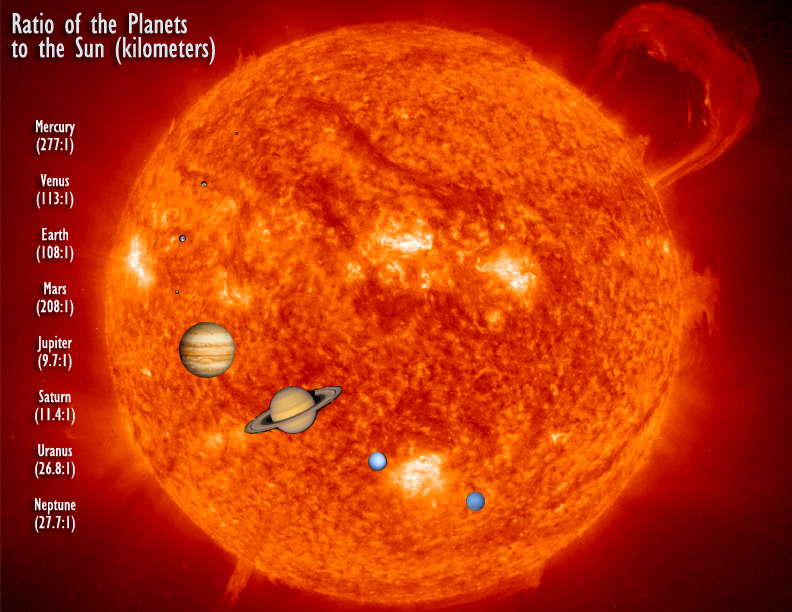 The giant planets probably have more small moons not yet discovered. Pluto has one moon. Rings of dust, rock, and ice chunks encircle all the giant planets. Saturn's rings are the most familiar, but thin rings also surround Jupiter, Uranus, and Neptune. Comets are snowballs composed mainly of ice and rock. When a comet approaches the sun, some of the ice in its nucleus (center) turns into gas. The gas shoots out of the sunlit side of the comet. The solar wind then carries the gas outward, forming it into a long tail. Astronomers divide comets into two main types, long-period comets, which take 200 years or more to orbit the sun, and short-period comets, which complete their orbits in fewer than 200 years. The two types come from two regions at the edges of the solar system. Long-period comets originate in the Oort (oort or ohrt) cloud, a cluster of comets far beyond the orbit of Pluto. The Oort cloud was named after the Dutch astronomer Jan H. Oort, who first suggested its existence. Short-period comets come from the Kuiper belt, the band of rocky objects orbiting the sun just beyond Pluto. Many of the objects in the Oort cloud and the Kuiper belt may be rocky chunks known as planetesimals left over from the formation of the solar system. Asteroids are minor planets. Some have elliptical orbits that pass inside the orbit of Earth or even that of Mercury. Others travel on a circular path among the outer planets. Most asteroids circle the sun in a region called the asteroid belt, between the orbits of Mars and Jupiter. The belt contains more than 200 asteroids larger than 60 miles (100 kilometers) in diameter. Scientists estimate that there are more than 750,000 asteroids in the belt with diameters larger than 3/5 mile (1 kilometer). There are millions of smaller asteroids. Astronomers have even found several large asteroids with smaller asteroids orbiting them. 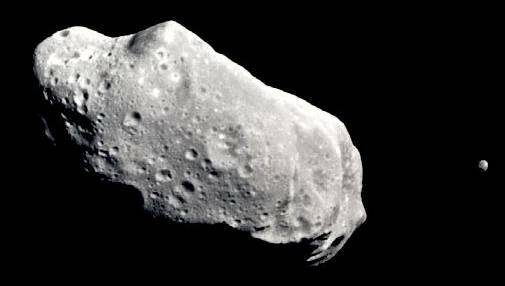 Meteoroids are chunks of metal or rock smaller than asteroids. 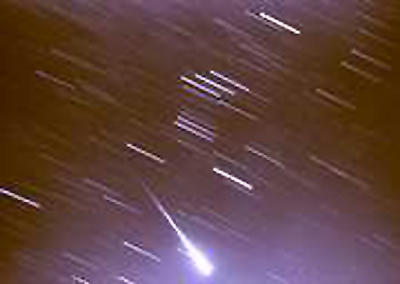 When meteoroids plunge into Earth's atmosphere, they form bright streaks of light called meteors as they disintegrate. Some meteoroids reach the ground, and then they become known as meteorites. Most meteoroids are broken chunks of asteroids that resulted from collisions in the asteroid belt. During the 1990's, astronomers discovered a number of meteoroids that came from Mars and from the moon. Many tiny meteoroids are dust from the tails of comets. Our word meteor comes from the Greek word meteoron which means "a thing in the sky." On any night, at any location, a few meteors can be seen each hour. These are called sporadic meteors, or simply sporadics. Occasionally, though, intense meteor displays fill the sky with tens, hundreds, or even thousands of of meteor trails. These displays are called meteor showers. Many meteor showers can be predicted, as they repeat every year when the earth passes through the path of a comet. The bits of debris left behind by the comets, most no larger than a grain of sand, create a spectacular light show as they enter the earth's atmosphere. Heliosphere is a vast, teardrop-shaped region of space containing electrically charged particles given off by the sun. Scientists do not know the exact distance to the heliopause, the limit of the heliosphere. Many astronomers think that the heliopause is about 9 billion miles (15 billion kilometers) from the sun at the blunt end of the "teardrop." The heliopause is the name for the blurred boundary between the heliosphere and the interstellar gas outside the solar system.